DTH Hammer Bit has been fabricated through numerous machining processes to deliver an immaculate body for high resistance to abrasion, wear and stretch that is normally experienced amid penetrating. These tools are designed to handle excessive pressure and perform extraordinarily in difficult situations. 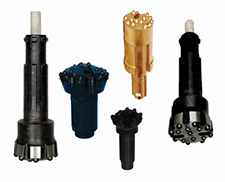 This tool is manufactured for drilling a wide range of drilling applications and drilling processes.